Liam Cole and Darius Tanz work near a virtual EmDrive mockup in "Salvation." 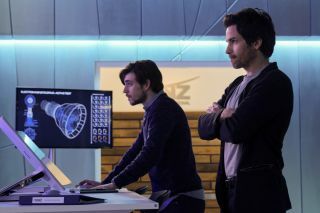 Last night (July 19) in the fictional television show "Salvation" on CBS, where an asteroid is on its way to slam into the Earth in six months, engineers talked about the EmDrive — an experimental engine that is supposed to break the laws of physics. While the plot is fully fictional, the EmDrive is not. So what is it about this device that is so controversial? The EmDrive is unlike any other engine used for spaceflight, because it doesn't use any propellant. Instead, microwaves bounce inside of a chamber. But here's the weird thing about it: Some researchers say the design appears to violate Newton's third law of motion, while others contend it doesn't. Newton's law, which is more than 300 years old, states (in simplified terms) that for every action, there is an equal and opposite reaction. A rocket is an excellent example of this; in space, pushing propellant out the rear end of a rocket will propel the rocket forward. While the EmDrive doesn't appear to push anything out the back, a peer-reviewed paper published in 2016 postulated that such an engine produces small amounts of thrust. The team, led by Harold "Sonny" White of NASA's Johnson Space Center, tested an EmDrive variant, which produced roughly 1.2 millnewtons of force per kilowatt of energy. This is about 100 times more thrust than what a solar-sailing spacecraft produces when it harnesses photons, the team added. They further cautioned that more testing is needed to rule out experimental error, but the 2016 paper does follow two other successful reports of tests — one by a Chinese team in 2012, using a different variant of the engine, and one by the same NASA team in 2013. EmDrive's concept is more than a decade old — it was first designed by British researcher Roger Shawyer — but it gained wide public attention in 2015 when rumors in news reports suggested NASA was creating a "warp drive." NASA quickly downplayed the reports. "While conceptual research into novel propulsion methods by a team at NASA's Johnson Space Center in Houston has created headlines, this is a small effort that has not yet shown any tangible results," NASA officials told Space.com in a statement at the time. "NASA is not working on 'warp drive' technology."